Body parts are some of the easiest words to learn because kids can use their own bodies as a reference. It is easy to connect parts of the body to language as kids touch and move. Most Spanish body parts songs include actions, and many also associate each part with a common verb. Here are ten of my favorite Spanish body parts songs. You may also be interested in my favorite movement songs to teach first verbs. You can check out more of our favorite Spanish songs for kids grouped by theme. This is one of the first Spanish body parts songs I teach, and it is always a hit. The song teaches just a few body parts, and it is short, fun, and kids get to clap, stomp and dance. Other artists like Sol y Canto have recorded the song, but I teach the version by Music with Sara. This is another of my favorite Spanish body parts songs. It has a catchy tune and teaches verbs related to the body parts. My students love this song! In the video below, Singalingo was presenting at a conference. You can listen to the song and the CD En mi casa is available from Amazon. I like this song a lot. It focuses on moving just brazos and piernas, but the language and movements are faster. The song teaches arriba, abajo (arms) and also estirar and encoger (legs). It is very clear, and it fun to sing and move to the music. You can hear the song in the video and purchase it from Amazon or iTunes. This is a Spanish body parts song to dance to! Kids move to the salsa rhythm and learn vocabulary at the same time. There is no video available, but you can hear a clip and purchase it from Amazon or iTunes. This is a wonderful song, and there is a fun video that you can see below. It is one of my favorite Spanish body parts songs because it also includes other vocabulary for the items being purchased at the market (melóncito, sandía, gis, calabacita). I have also used it as part of an ant theme. You can purchase the song from Amazon or iTunes. I included this song here because it is traditional and fits into many themes. It does teach some body parts, but also teaches colors and clothing (more or less clothing depending on the version). I like it because it is cumulative and kids learn so much by repeating the list each time. You can hear the song in the video and purchase it from Amazon or iTunes. This is a new song from the latest video by 123 Andrés. It teaches body parts, and also plays with rhyme. 123 Andrés has an excellent teacher/parent guide with activities available for the songs on the album. It is a fabulous resource! He also has lyrics sheets formatted for early readers. You can find both the lyrics and the teacher/parent guide here and purchase the song from iTunes and Amazon. This is a very clear song that gets kids moving as they act out verbs for each body part. It includes an appropriate amount of additional related vocabulary, and it a great choice for beginning learners. As far as I know, Calico Spanish does not sell individual songs, but you can check their website for purchase options. Like Rockalingua’s other songs, the body parts song fits well into an elementary Spanish program. It has more theme vocabulary than some of the other songs, but it is well supported as kids touch each part as they sing. See the free video and check out the free printable picture dictionary of the vocabulary that you can use for a variety of activities. Los Bosquiprofes presents musical children’s theater, and this song is from one of their productions. It doesn’t mention the body parts themselves, but instead asks questions and leaves a pause for kids to answer: ¿Con qué miramos?, ¿Con qué oímos?, etc. The lyrics are on the screen, so you’ll see that beginning of the song mentions a character, Berta, who doesn’t know the parts of the body. The idea is to help her learn. The song is a great choice as review and also for a five senses theme. You can hear the song in the video and purchase it from Amazon or iTunes. 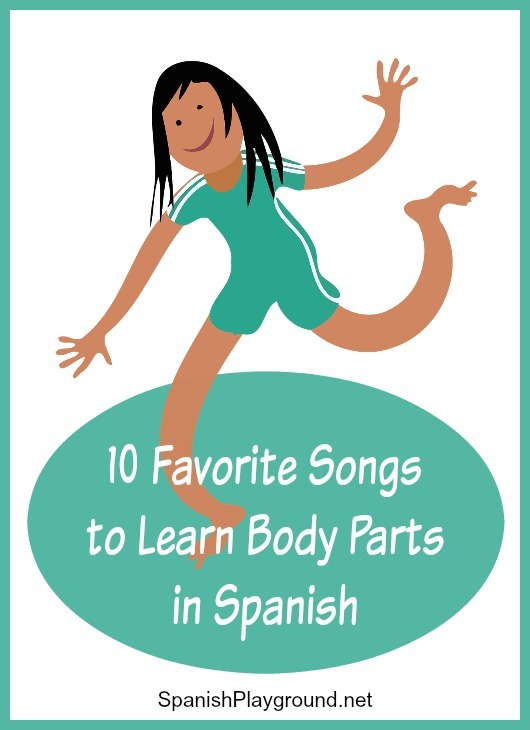 There are many more Spanish body parts songs, and they are great learning tools for a wide range of ages. Many teach verbs and additional vocabulary, so they can be included in other themes with a body part review built in. What are your favorite Spanish body parts songs? Please share! One of our favorite songs is by “Muévete” (same album title). Actually the whole album is great. First discovered at our local library, it’s a must for young Spanish learners and Spanish-speaking natives with young children! Thank you for the recommendation! I will look for it and add it to the list.